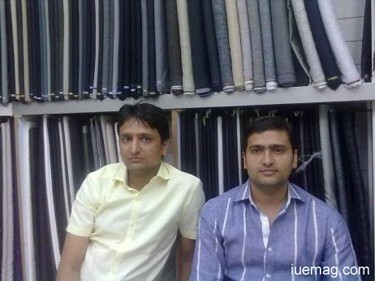 Jitendra Jain and Rajesh Jain are the owners of 'Manyavar' - textile showroom. They are indeed one of the happiest teams one can ever see. And is the reason for their success as well. Let's Know more about their business from them.. When did you start your venture? Please brief us about your venture. We started business in the year 1969. But we entered the textile market in 1991. We opened a showroom of 1200 sq. ft. way back then, where a showroom of 200 sq. ft. was considered big. We were the third showroom of this area and it was the first big showroom too. We started with unstitched clothes and today along with that we are experts of ethnic wears (Sherwanis). Sherwanis are our specialty. People from many where come to our showroom exclusively for that. We have professional designers hired and we also customize them. How many showrooms do you have? I saw Manyavar in few other areas as well? We have one showroom. Yes you see many Manyavars around. They don't belong to us. But we have given the name 'Manyavar' to them to use on royalty basis. They have six showrooms totally and we are planning to partner with them soon. Have you ever faced downtime? Well, down time is a part and parcel of any business. We were nothing special to it. It did visit us as well (..little laugh). 1998 was one of the toughest phases that we faced. For almost three years.. Readymade garments entered and captured the whole market. We did try our hands out with readymade trousers and shirts and didn't work out again. It was definitely a shock. I had lost all the hopes. That time we planned to explore into various other fields, but ended up doing nothing. Tension prevailed for a pretty long time. How did you recover from the phase? My younger brother, Rajesh didn't give up. He said we have to do something and went to Mumbai to find a way out. He assured with a firm voice and consoled everyone, telling that we are not giving up. We'll definitely find a way. He went and came with a break through idea of dealing with Sherwaanis. Here in Bangalore there are no professionals of Sherwaani and this was definitely a plus point for us. And from there it boomed like we never thought of. Belief is the bottom line. If you believe you can turn any situation around. There are many dealers in the same field. How do you sustain customers? I don't deny! There are many competitors arriving around. But we know we are the best and we believe that when you are genuine, customers will come automatically and they refer us to their circle. Whichever field you enter into, genuineness protects you always. We treat them like family. They feel homely at our Manyavar. If we can't cater to their demand, we don't dump anything and send. But we genuinely accept it. That's why they come back to us every time. Around 15 people are working with you and I can see them all happy. What do you do to keep them happy? They work in unity. Making them feel the ownership of what they do and also trusting their work is very important. So that's the secret of their happiness. Only two should deal with one customer and they talk to them very happily and customer satisfaction is the top priority for them. They support each other and trust is our strength. Any facts, figures or references stated here are made by the author & don't reflect the endorsement of iU at all times unless otherwise drafted by official staff at iU. This article was first published here on August 2012.